Last week, when I wrote about Merieke Ri Berit and Olivia Voldaren, I compared the two generals and how I tried to emulate one with the other. For the most part, I feel like I succeeded. Olivia steals creatures like Merieke does, and she can control the board while continuing to be a fun card to play with. But what I haven’t done yet, is let the deck evolve to support itself if something were to happen to Olivia. According to Gary, he started the deck with cards specifically with Merieke in mind, but they eventually got pushed out for cards that were better on their own, like Consecrated Sphinx. It eventually got to the point where he could win without relying on Merieke. She became specialized spot removal rather than the focus of the deck. He had created a deck that no longer “needed” to cast his commander to be effective, and he would go on to do the same thing with his current take on Hazezon Tamar. Anyone who’s more than casually interested in EDH wants their deck to be the best it can be, but is it wise to relegate the flagship of your deck to accessory status? How much does your general do for your deck? When you’re talking about people who play voltron with Zur the Enchanter, or Skullbriar, the Walking Grave, then obviously your general’s carrying most of your deck on their back. If something happens to them, then your deck loses a lot of power and you’re left struggling to get back into the game. Other decks tend to use their generals as an additional resource, or part of a combo engine, like you’ll see in Ghave, Guru of Spores or Hanna, Ship’s Navigator. The decks are plenty powerful on their own, but the generals help the process along. Merieke and Olivia fall into this category as well, since they act as forms of removal more often than not. Finally, there are decks that are effective enough to win without ever casting your general. Gary’s decks tend to be like this because the generals he plays with have a much smaller impact on the game. Hazezon is a costly general who actually needs to leave play before he becomes a liability. Merieke is manipulative and needs other creatures to be on the board before she can do anything. With these types of generals, the deck needs to be naturally stronger to compensate for their weaknesses. Personally, I tend to build decks in that exact order. Most of my decks start by finding a general that gets me excited to build around, like Kaalia of the Vast, Jor Kadeen, the Prevailer, and Odric, Master Tactician. Sometimes I have a general I want to build around, but they aren’t strong enough to win a game by themselves. I build the deck to best use their abilities, but they’re still the main focus. This was the case when I built decks for Teysa, Orzhov Scion, Sharuum the Hegemon, and my current Damia, Sage of Stone project. All of those decks rely on the general, but I only have one deck that follows the last motif for deck building. It would be ridiculously easy for me to build an aggressive bant deck around Jenara, Asura of war. I’d love the chance to include aura packages, and play Finest Hour with Rafiq of the Many to enhance her. I would go out of my way to include all sorts of exalted cards and really play up Bant’s original mechanic. I’d probably really enjoy it. But then, I wasn’t the one who built the deck. The deck I use for Jenara was actually net decked off of a list on MTG Salvation, and was put together by ISBPathfinder (which you can find here). While I can’t remember why I decided to look up a deck for Jenara rather than to try and build my own like I had for all of my other decks, I do remember playing with the deck and being surprised at how efficient the deck was without its general. I have to admit, the feeling was oddly liberating. As a newer player who had ridiculous emotional attachments to my cards, I would get upset whenever Kaalia was removed or tucked during a game. My deck needed Kaalia to go, and if she wasn’t going, then it felt like everything had ground to a halt for me. I became a sitting target who was wiped out within the next couple of turns by other players who wanted to some payback for the early beatdowns I was handing out. I made the Kaalia deck better over time, but everytime I rushed to play her I felt like I was in a race against everyone else. Either I was going to be able to protect Kaalia and start swinging in to win the game, or she was going to disappear and I was going to be a lonely man, with few cards in hand, and virtually no way to get back into the game. The anxiety it was causing was starting to get to me to the point where even my victories felt rushed, unsatisfying, and like I had just survived a closet full of spiders. I had to take a break from Kaalia. It was about this time that I finally had a chance to start testing out the Jenara deck. Boy…was it ever different. The idea behind the deck was to win with incremental advantage. Slowly, and subtly, ramp more lands out and draw more cards than your opponent’s were. Let them run out of gas while I had plenty of answers and other cards to play. This deck definitely had answers. Being an optimized deck, it had some of the pricier cards that I didn’t have (but could proxy up anyway) with value engines that weren’t degenerate, but were just powerful enough that they’d win the game if left unchecked. Jenara was used to plug whatever holes the deck had for any situation. If I had an aggro player breathing down my neck, she would either act as a blocker or would start racing the aggro player to see who would get knocked out first. The first few games I played, I held Jenara back for fear that she would be ruthlessly mugged like Kaalia had been. But as the game went on, I found other stuff that I needed to do to advance my board position. I won the game casting Jenara all of one or two times. Emboldened by the win, I started casting Jenara a little more frequently, usually early in the game to get some quick strikes in before Jenara was inevitably removed or tucked. But losing Jenara never hurt me like Kaalia had. It had gotten to the point where someone would Terminus Jenara away, start patting themselves on the back, and think they had dealt me a heavy blow. In reality, I was puzzled as to why they thought this was a major accomplishment. There were even games where I sacrificed Jenara to Birthing Pod in order to fetch a Solemn Simulacrum to start ramping into the rest of my deck, and I did so without a second thought. 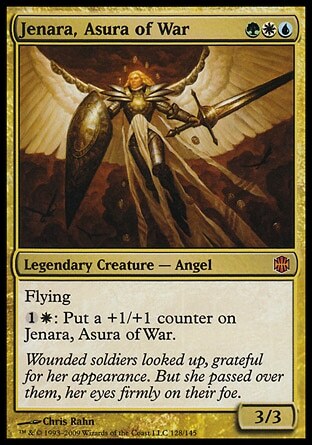 Unlike Kaalia, I don’t share an emotional connection with Jenara. It might be because the deck was built by somebody else, but I tend to believe it’s because that’s simply how the deck works. It was put together with an idea almost unrelated to its flagship, and it feels vastly different than any of the general-centric decks I have. That’s not to say Jenara doesn’t benefit from the deck. Certainly incremental ramping plays well with her ability to pump herself with +1/+1 counters, which allows her to scale as the game goes on. The deck also features plenty of creature tutors that can get her back if she’s tucked and I feel she gives me the best chance to win. In these ways, she’s almost the ideal general for this type of deck. The calming effect of Jenara’s started to carry over to my other decks as well. I can wait and be patient when playing Kaalia, waiting for the right time to cast her before I start swinging. I’ve even started including “smaller” creatures into the list to take the burden off of her (hello, Thundermaw Hellkite). There’s really no way to describe it other than…“odd”. It’s odd that a deck built for a format where the general is the most appealing aspect would almost treat the general as an afterthought. It’s odd that a player would actually be okay with their general getting tucked, particularly if there aren’t any “replacement generals” to use. But it’s also a part of what makes the game interesting. Not all generals are created equal. Some are more suited for the spotlight than others are. Hanna won’t win a game by herself like Skullbriar will, and no two players will make their decks the same way either. I’ve played with Jenara and Kaalia plenty, and I actually enjoy the sharp contrast in play styles that each deck requires me to use. However, I don’t really see myself making any other decks like Jenara for now. This is, after all, Commander; and Commander is, by definition, about the first card you show everybody when you’re about to sit down to play with. As always, if you have any comments/questions/ideas for articles/etc, feel free to leave some comments down below, tweet my account @BlueRam1409, or send an email to my inbox at Wiehernandez(at)gmail(dot)com. I’m also “BlueRam” on the MTG Salvation forums. I really do enjoy getting feedback for my work! Join me next week, as I share some of the trials and tribulations that Commandercast’s secret tech has gone through. Until then, keep an eye on how much weight someone’s general carries before you play Terminus. It’ll be the difference between an indifferent shrug and a table that’s suddenly gone airborne.